We left Port Ludlow at 5:45 am riding the ebb out to the strait of Juan de Fuca. The morning welcomed us with an amazing sunrise and calm water with only a slight breeze. We motored out making great time and were at the opening of Puget Sound and the Strait before we knew it. The great weather did not last. The next thing we knew we were socked in with cold wet thick fog and a washing machine of waves. We kept a close eye on the radar and a watch for any and all boats around us. When we left in the morning our destination was Lopez Island, but we were making such good time, (riding the ebb out and then the flood up to the islands) that we decided to head straight for Cypress Island. The fog stayed with us till we were passing Anacortes and we were welcomed to the island with warm sun, and we were happy to be ditching our foul weather gear needed the whole morning to stay warm. Getting into Eagle Harbor can be tricky, there are a lot of moorings and boats around plus a shoal in the middle of the harbor that is unmarked. We motored around looking for a depth and place we liked, watching our depth sounder 24ft…. 23….22…17….14…..5.3ft HOLY SHOAL! thank goodness it was just sand and we were going slow enough we were able to back our way out. That was fun! We dropped our hook around 1pm and I set out to make some lunch, and the meat bees descended on us. We fought them off as much as we could but gave up and retreated inside. After an afternoon nap catching up on much needed sleep we reemerged outside to enjoy the evening, even went for a kayak putt around to the other boats in the harbor. Looking out to Prism with Mt. Baker in the distance. Wednesday morning we set out to hike to Eagle Cliff. It was a good hike, straight up it felt like, but so worth it! The hike thought the thick forest was beautiful and the view from the cliff was breathtaking and we had the whole thing to our selves. On Thursday morning we woke up bright and early to head back down to Anacortes to pick up a Gig Harbor Dinghy we found on Craig’s list. We had to fight a ebb tide going into the harbor but once we got there we picked up the dink which is 9.5ft long not the 8ft it said it was, but it fits and looks great! 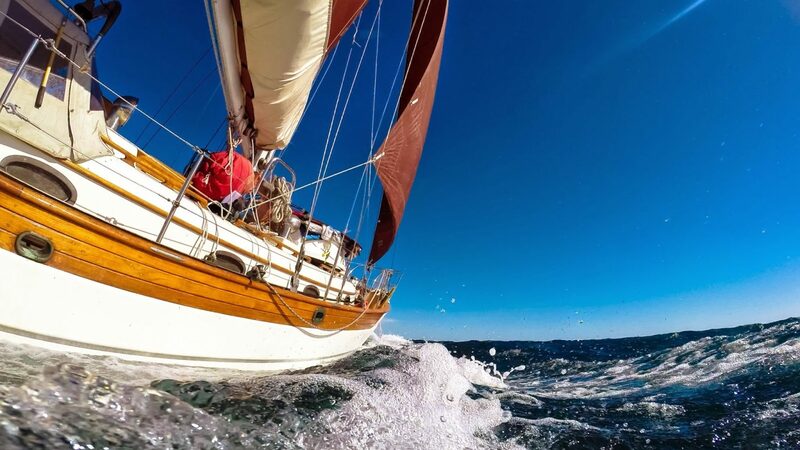 Came with everything a sail rig, sails and nice oars! We grabbed a guest slip for a few hours so we could fart around the history downtown Anacortes. The marina was nice enough to not charge us for the 3 hours we were there. We just had to walk down to check out the oldest chandleries on the west coast. SO WORTH IT it was a very cool shop! We left Anacortes with the new (to us) dinghy in tow and headed to Sucia Island, we had the flood tide to help us out. The wind came and went more often then it stayed so we just motored. Once we made it to Echo Bay it was packed! There must have been over 40-50 boats everywhere. Finding a place to drop the hook and have enough room for scope and swing, well it was limited. The first 2 attempts were a no go we could just not get our spade anchor to grab. We believe the reason we are having a hard time setting the spade is because we should have bought an anchor swivel that was recommended to us by experienced boaters from the San Juans. Jon didn’t heed the warning about the nightly dance that the boat will do while anchored up here. Our anchor chain has now developed a twist. So twisted intact that it is not allowing the anchor to bury its self into the mud. But the third time is a charm and got the hook to stick. We rigged up the new dinghy and I took it out for its first sail! The wind was light and fluky so it was just a few tacks back and forth before my feet started to get way cold. We dropped the mast and grabbed the oars to go for a harbor row to checked out some of the nearby boats and then headed back for dinner and sleep. We watched an amazing sunset, took some cool pictures and then hit the hay. Thursday night might have been one of the worst nights we have had while out on anchor. Around 12:30am the wind started to blow and increased till it was a constant 25 with gusts up to 30. Prism was not moving an inch, the boat around us?…. Jon stayed up for about an hour keeping an eye on some of the boats, once it looked like there was nothing else he could do, he put the fenders out and we just wish all the other anchors will hold till morning. Come morning we were one of only a few boats left in the bay. Not sure if people left in the middle of the night to get away from everything or if they took off at day break. We will never know. We were going to head to shore to check out Sucia but it just did not call out to us, so we pulled anchor and set out to Stuart Island hoping that the good wind would hold up. Oh man did it hold up! Our whole sail today was amazing! We had 15-20knts of wind so we were just sailing with main and jib, but the wind grew to 20-25knt with gusts up to 30 so we reefed the main and brought the jib in and hoisted the staysail. WE WERE FLYING! We were scooting along doing 7.8knts with a max speed of 9.4knts! We got to Stuart Island so fast we were amazed. However we still have not seen any orca whales and are a bit bummed about that. We came into Prevost Harbor and welcomed the calm water and peacefulness. We dropped the hook, made some lunch and took the dink out for a sail. Jon and I both went this time and I am happy to know how well it sails with 2 people! Fun fun fun. It’s late, its been raining off and on, but we do have good Internet (thank you wirieAP) so we were able to watch a movie on netflix! We are getting up and going ashore tomorrow morning and hiking out to the light house on Turn point. Really looking forward to it, and we are hopping the rain moves on. Such a great little dink! I've been to that chandlery in Anacortes many times, always a neat place to go. Had no idea it was the oldest on the West coast!